India’s last Olympic Gold Medal was from Hockey, at the Moscow Olympics in 1980, when the Indian Hockey Team won the Gold Medal. 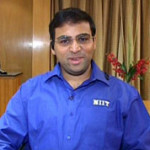 has now won India’s first ever Individual Olympic Gold Medal on 11th August 2008, Monday with a thrilling “come-from-behind victory” in the men’s 10 metres air rifle event in the Beijing Olympics 2008. Abhinav Bindra was only the fourth after qualifying rounds, but had a brilliant final round and even hit a near perfect 10.8 on his last visit to pull in front of Henri Hakkinen of Finland, who dropped to Bronze Medal, with a poor final shot of 9.7. That allowed China’s Zhu Qinan, the defending Olympic champion and heavy favourite, to pass him on his final shot and win the Silver Medal. 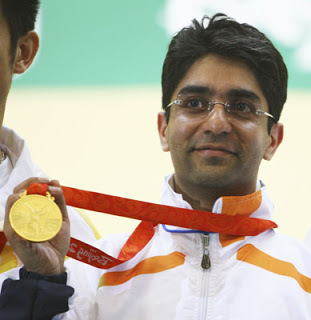 Abhinav Bindra was born on 18th September 1982 at Zirakpur in Mohali District of Chandigarh, Punjab,India. His father is Dr.A.S.Bindra and his mother is Mrs.Babli Bindra of an affluent Sikh family. Abhinav studied at the Doon School, Dehradun till his 10th standard and then left for St. Stephens School, Chandigarh to pursue shooting . Abhinav Bindra holds an M.B.A./Masters Degree in Business Administration and he is the CEO of “Abhinav Futuristics”, a PC games peripherals distributor based in Chandigarh. Abhinav Bindra’s potential talent was first spotted by his first coach Lt. Col. J.S. Dhillon. Abhinav Bindra was the youngest Indian participant at the 2000 Olympic Games. Abhinav Bindra is the current World and Olympic Champion in 10 m Rifle Shooting. 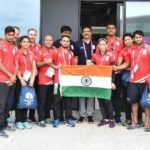 Abhinav has become the first Indian to become an Individual Gold Winner in Olympics. 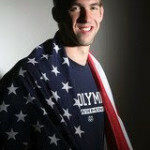 He had won the 2006 World championships and finished seventh in Athens four years ago. Abhinav Bindra had been awarded “Arjuna Award” in the year 2000 and “Rajive Gandhi Khel Ratna Award” in the year 2001 in recognition of his various achievements in his field of Air Rifle Shooting. After becoming the Gold Winner in Olympics,Abhinav Bindra is continuously receiving announcements of Cash Awards from the Government of India and various State Governments in India, and Life long unlimited, Free Travel in Air conditioned First Class in Indian Railways. 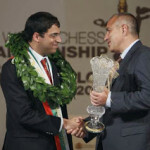 Will India’s Chess Grand Master Viswanathan Anand become ‘Bharat Ratna’? One Response to "Abhinav Bindra India’s First Individual Gold Winner in Olympics"
Really nice shooting place. You can make your life with fun. You can learn how to use the air rifle and how to play this game. Then you can participate the tournament and make your life meaningful. For more information you can read about the reliability of airsoft guns.